If you are looking for the best place in the world to have a family holiday then look no further than The Four Seasons Landaa Giraavaru. We arrived in the Baa Atoll by seaplane and could see we were in for a treat at this stunningly beautiful island before we had even landed. 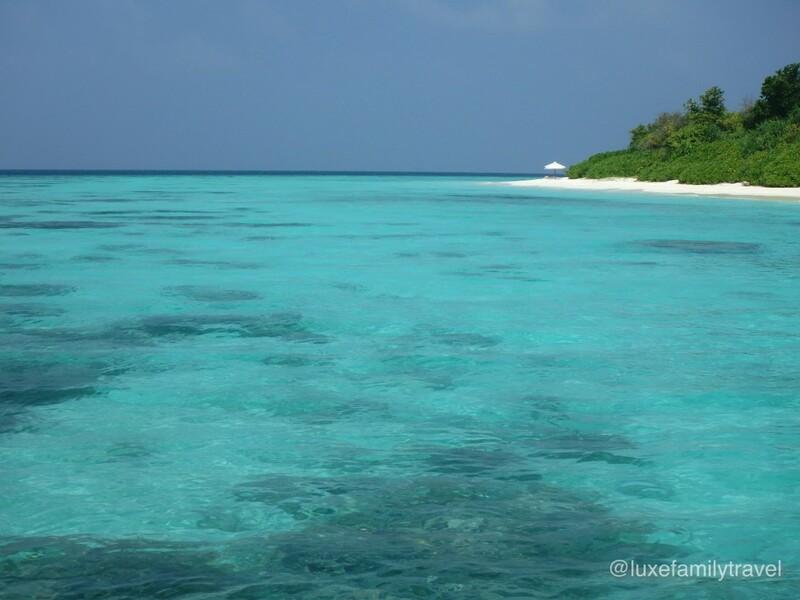 The Four Seasons Landaa Giraavaru is a beautiful modern resort with an incredible powder-white sandbank close by so the waters glow a bright blue all day long as they are very shallow. 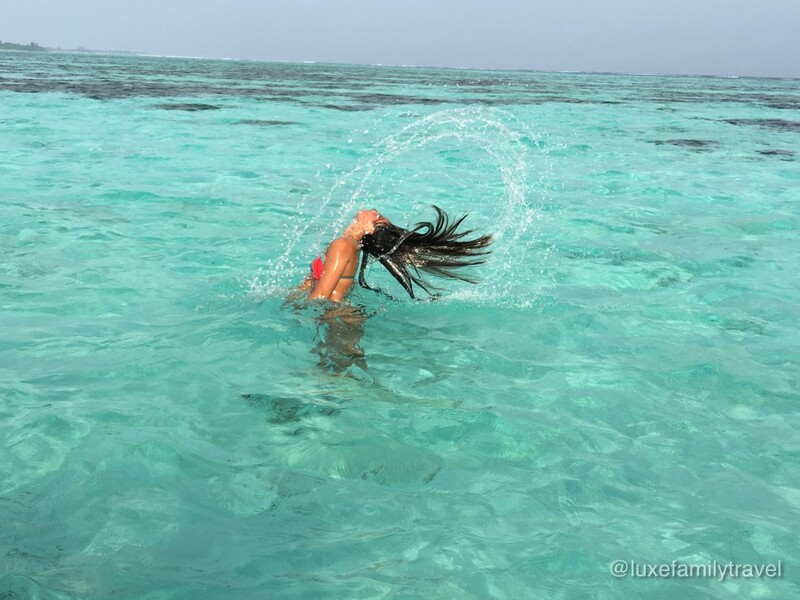 This resort is perfect for families and children are so well catered for. Upon arrival at reception the Resort Manager presented our boys with a backpack full of little toys and a “Mission impossible” book for our older child to go around the resort completing missions. If complete then the child receives a prize of a motorized water activity! Our boy completed the missions (which are not easy and it took some time with the help of Dad!) but it was worth it as in the end he received 30 minutes on the underwater sea-bob. We had two water villas, a sunrise and a sunset one opposite each other. Both views were picture perfect, however, we really loved our sunset view. The villas are very modern with the most comfortable beds we have ever experienced in all our travels. The bathrooms have an over-flow bath and glass panel in the floor so you can look down at the fishes below. One day house-keeping left some cute little sea-creature squirt bath toys for our little boy, such a nice surprise. When we arrived in our villa there was a bottle of ice-cold champagne and some refreshments left for the children with their names written in chocolate on the plate. In the wardrobe were adorable toddler sized bathrobes and slippers for our son and fit him perfectly. Every day my boy would come back to our freshly made room to find a soft plush toy left on his pillow – one day it was a shark, another day a fish, another day a Manta Ray. It was so lovely to see his eyes light up when he saw his daily surprise. The children’s meals were very fresh, healthy, served with vegetables and were a good portion size. Every time we ordered a drink for the children it would arrive in a plastic cup with a lid and straw so it’s very easy for little fingers to handle and there’s no worries for parents the children might spill or break something. Our favourite restaurant was Blu and each day we had a fantastic long lunch there. Blu is a glamorous all white open air restaurant right near the amazing beach and had a swimming pool attached. We would order the kids lunch while they had a swim in the pool and we could easily call them when the food arrived. We enjoyed all the restaurants immensely and were lucky enough to witness an incredible sunset whilst dining outdoors at the Middle Eastern restaurant one evening (which incidentally serves the most amazing tabouli I’ve ever had). Blu beach was where you would find us every day as it is a divine powdery white sand beach with calm clear shallow aqua water that is perfect for children. As soon as you arrive at the sunloungers on the beach you are brought iced water and cold towels. Throughout the day we were also brought a small complimentary treat – one day it was fruit on skewers, another day it was a shot of sorbet and one time it was caramelised coconut (which was absolutely divine too!). There were a variety of sunscreens available complimentary including SPF50+ for babies at a central stand so you could reapply freely. Travelling with four children, for us this was a great touch as it saved us from bringing loads of sunscreen from home. Each morning our boys spent time at the kids club. It was well designed with a children’s pool with waterfall, adorable mini sunloungers, a pirate ship climbing toy and slide and some swings. Our boys made tie-dye T-Shirts which they still love and there were also outdoor activities such as snorkeling included in the complimentary kids club. There is a turtle sanctuary at the Four Seasons where guests can go and visit the large turtles who have been rescued and are being rehabilitated. In fact on a sandbank tour one day we found a turtle tangled in nets and it was brought to the Marine Centre for a health check and to be tagged and released. The turtle was named after our family and we were able to go to a nearby island to release it with staff so that was a real highlight of our trip. Another thing my children enjoyed was the daily 10pm shark and stingray feeding. A lot of sharks and rays come in for a feed and it’s very cool to get so close to them as they feast. We tried many actives at this resort. One day we hired a jet-ski and did a tour to a beautiful sandbank and I recommend you include it to your itinerary. Another highlight was the Manager’s cocktail party. It was set up beautifully on the white sand and it was nice to chat to the staff informally, many of who we now considered our friends. The children were kept occupied by flying kites with the help of staff, that was a genius idea and lets parents have a bit of time off to have a drink and chat to staff. One afternoon we were treated to a luxury champagne sunset cruise which was breath-taking and gave us a chance to see the new private island they are building nearby. We had treatments at the day spa which were great quality and we especially loved the complimentary consultation with the Ayurvedic doctor. He said some things that were life-changing and we think of him often even now we are back home. We took an aerial yoga class which was fun and challenging and we also went on the turtle snorkel tour and got to swim with some turtles. The girls also had a turn of jet-blading which they tell me was really hard to balance but a lot of fun! All the children had some turns on various inflatables that are towed by a speedboat. The resort had a huge variety of inflatables to choose from it was quite an impressive sight! We also tried out the newly constructed yoga trail which you follow around the island and at each station there is a yoga pose to do on different equipment, we all really enjoyed that. It was with heavy hearts that we said goodbye to this resort. The staff at the Four Seasons Landaa Giraavaru were so warm and lovely and referred to us by name at all times and it’s such a family friendly resort, the best we have been to, that we will definitely be going back. 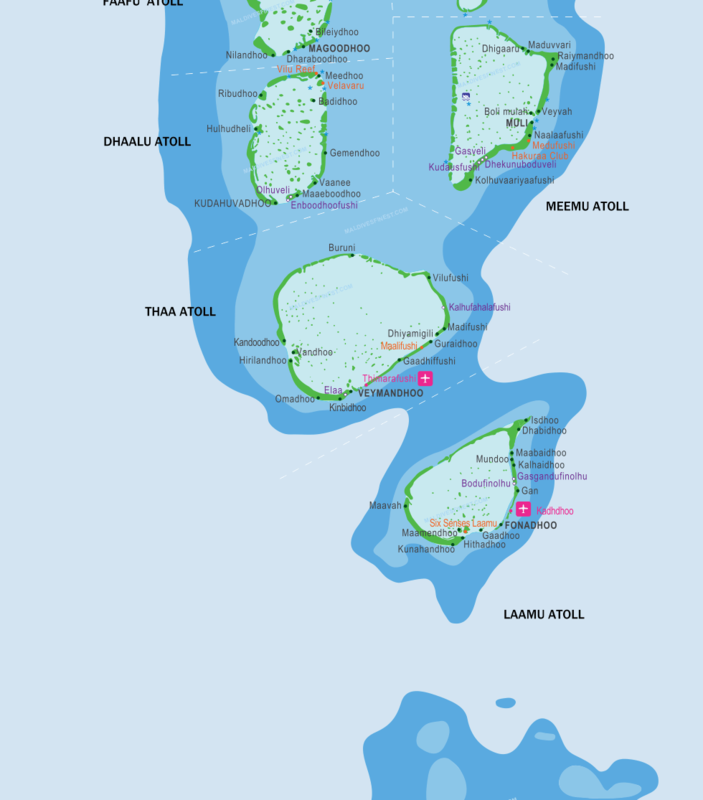 The Four Seasons Landaa Giraavaru is located in the Baa Atoll, see below. 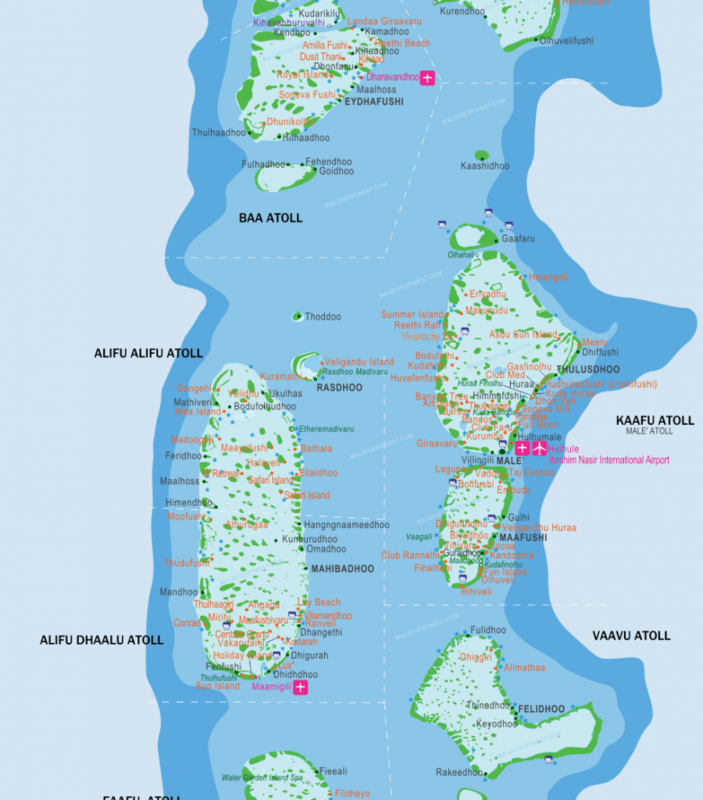 Above map via Maldives Finest, click on the link below to see a larger map on their site showing more islands.